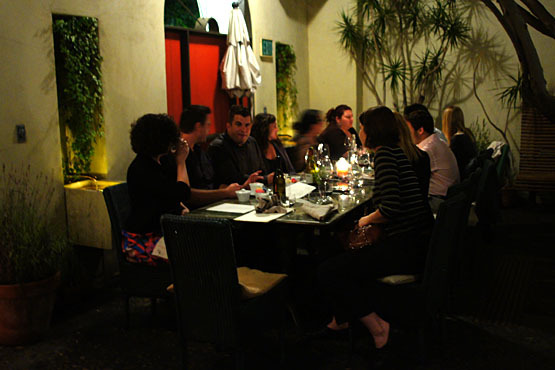 Since debuting in 2001, Bastide has firmly established itself as one of LA's most famous, and infamous, dining destinations. 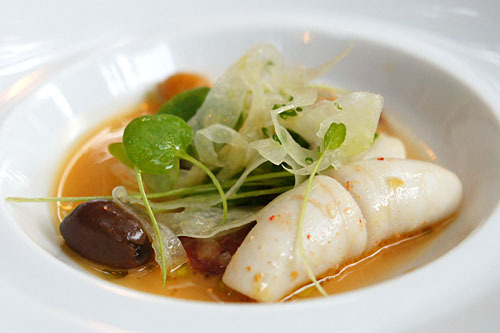 At the whim of its notoriously erratic, ill-tempered owner, Joe Pytka, Bastide has gone through a series of chefs: Alain Giraud, Ludovic Lefebvre, Walter Manzke, Paul Shoemaker, and now, one Joseph Mahon. I was quite impressed by Mahon's handiwork during my previous visit, so when I was invited to this special event to kick off the new "Mondays at Bastide," I jumped on the opportunity. 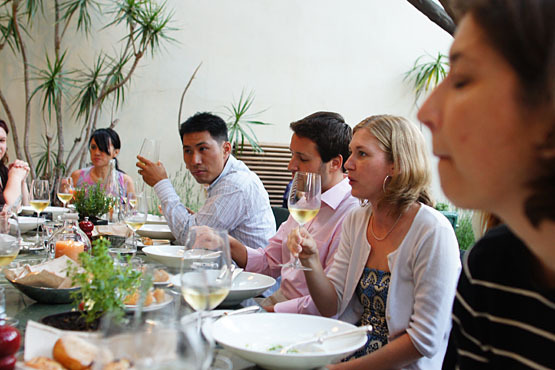 Here's how it works: every Monday from 5:00-7:00, for $15, guests will be able to sip one of three wines by the glass, sup Bastide's signature Soju Martini, swig a weekly-changing cocktail, and savor small bites from the menu. Not a bad deal, if you ask me. Joining me this lovely summer evening were: Caroline of Caroline on Crack; Dana Harris, editor for Variety.com, author of The Knife, and creator of All About Eat; Diana of Diana Takes a Bite; Elina Shatkin, West Coast editor for Toque Magazine and author of Guzzle & Nosh; Eric Rosen, restaurant and wine contributor for LA.com and author of Eric the Epicure; Erin Magner, assistant editor at Angeleno magazine; Esther of e*star LA; Hadley Tomicki from Grubstreet; Jeff Miller, Los Angeles editor for Thrillist; Lindsay William-Ross, LAist co-editor; and Tony of SinoSoul. Meanwhile, representing Bread and Butter PR were Melissa Barto and Monique Ianos. 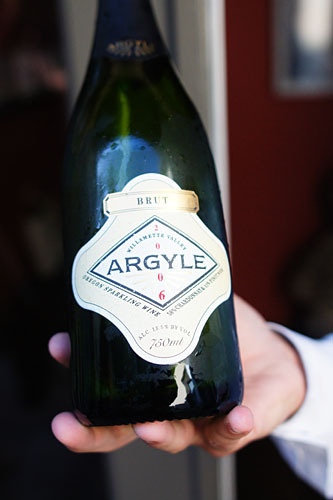 As soon as I arrived (the first to do so), I was greeted by Melissa, and then, mere seconds later, handed a glass of the 2006 Argyle Brut by Bastide Sommelier Dario Dell'Anno. A sparkler from Oregon's Willamette Valley (58% Chardonnay and 42% Pinot Noir), the tipple demonstrated a crisp, chalky minerality, balanced by overtones of citrus and pear. A bit of yeastiness was present too, along with some lingering heat towards the end. Monique and Hadley joined us soon after, and we subsequently moved into the courtyard to enjoy some sumptuous passed hors d'œuvre, the first of which was this delightful pork rillettes. 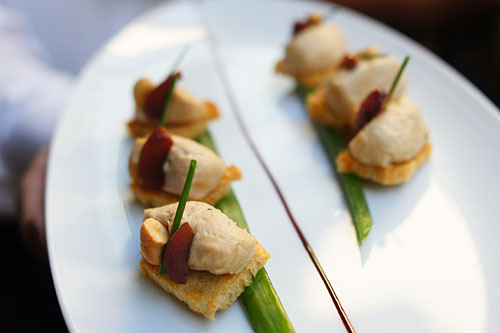 Fantastically porcine in savor, the rillettes was deftly complemented by the sweetness of the cherries, while the cashews added just a hint of nuttiness and a superb crunch. Nice! 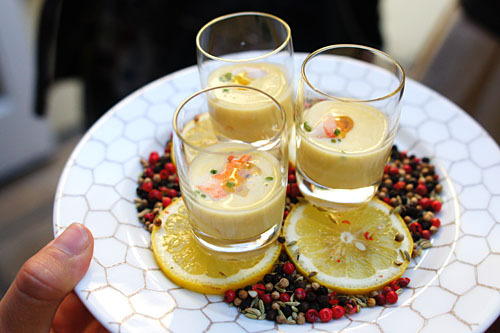 Next up was a lovely summer soup. The curry oil really gave the potage a bold, heady aroma and a great tinge of spice that aptly balanced the sugariness of the corn. Meanwhile, the shrimp--still snappy in consistency--added considerable depth and character to the dish. 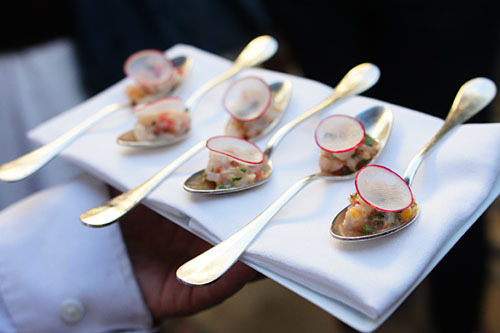 Our final canapé came in spoonfuls: yellowtail tartar. Thanks to its various accoutrements, the hamachi was a fantastic showcase in light, bright, sweet, sour, and herbaceous flavors, paired with a slight puckering acidity--my favorite of the troika. 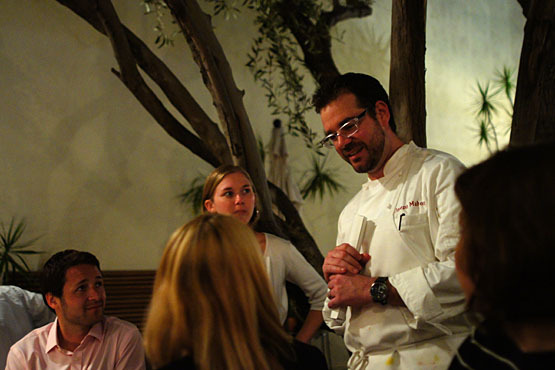 Dell'Anno then poured the 2008 Éric Texier Condrieu Opâle, from France's Northern Rhône. 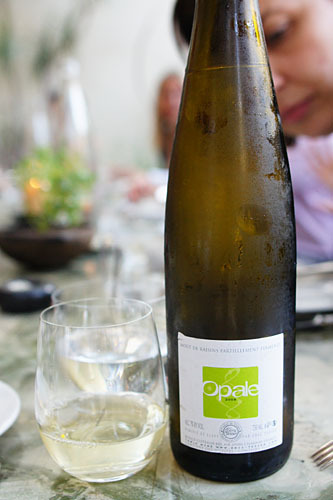 Though oft described as similar to a German Riesling, this was, in fact, an off-dry Viognier. I loved the wine's immensely floral nose, backed by tons of melon and stone fruit on the palate--perfect for fun, summer sipping. 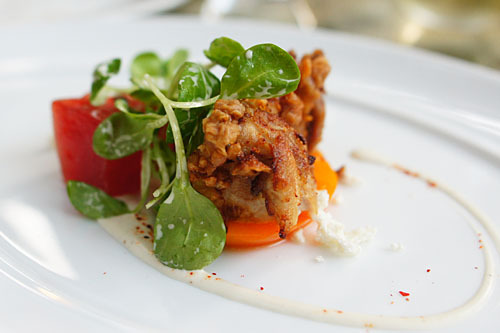 In a city overrun by fried chicken, Mahon's version is still a force to be reckoned with. Delectable salty and succulent, the thigh paired wonderfully with the sweetness of the watermelon and tomato, while the feta added a palpable heft to the dish. Finishing things off beautifully was the marked tang of the mache. 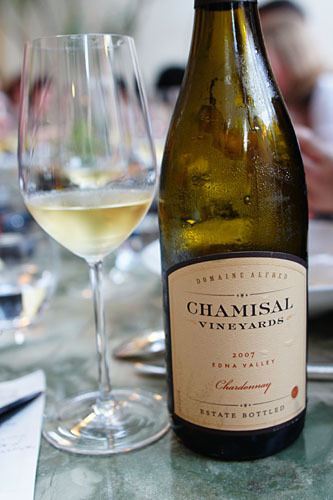 The pairing for the next two courses was the 2007 Domaine Alfred Chardonnay Chamisal Vineyards, offering up flavors of toast and oak, with some apple and lemon in there as well. Here was another strong course from Mahon. I loved the squid's texture--tender, but yet with a bit of bite. The cephalopod's natural brine was heightened by the saltiness of the chorizo, which also contributed a prick of lingering heat on the finish. 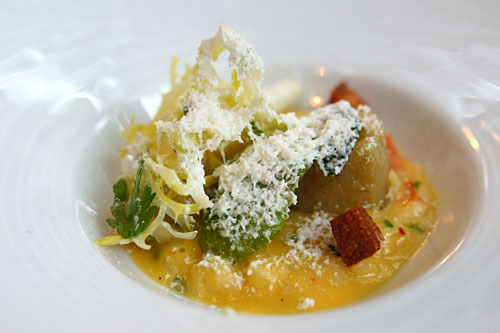 The fennel, meanwhile, provided a pleasing crunch to things, and also served as a zesty counterpoint to the dish. Regular readers will know that I'm somewhat of a risotto fiend, so I was definitely looking forward to this next course. The rice was effectively imbued with the weighty smack of tomato, and was further augmented by the inclusion of chèvre. At the same time, the artichoke served as a further point of interest in the dish, and I really appreciated the herb salad as an offset to the other ingredients at play. 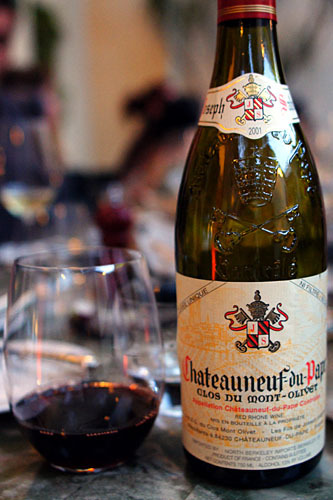 Wine #4 brings us to Southern Rhône, and the 2001 Joseph Sabon Châteauneuf-du-Pape. This was a hefty wine, with a peppery, almost meaty nose. 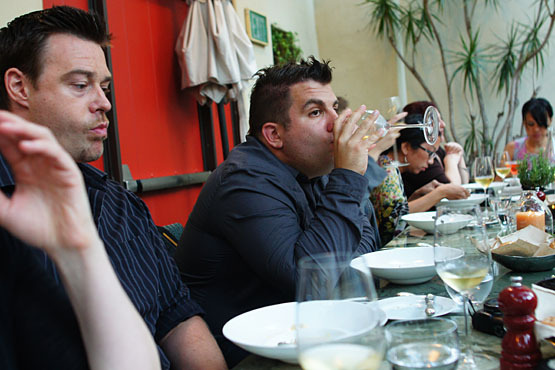 Such flavors continued onto the palate, where they were joined by notes of dark berry, wood, and spice. And here we come to my favorite course of the night, and one of the strongest presentations of salmon that I've ever tasted. The fish was cooked sous vide, then poached in olive oil, giving it a supremely succulent, tender, oily consistency and a stupendously savory relish. 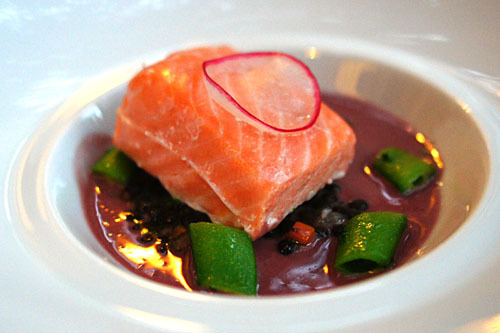 The salmon easily stood alone, but was also aptly accented by the piquant port reduction (which I'd feared would be overpowering), the earthiness imparted by the lentils, as well as the bright, green flavors of the peas. 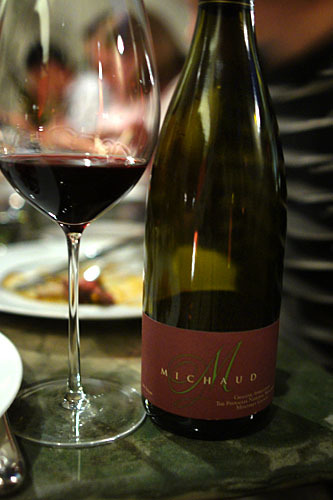 Our meat course called for the 2004 Michaud Syrah The Pinnacles, from California's Central Coast. This wine demonstrated tons of berry flavors, intermingled with peppery spice and herbs, and perked up by some firm tannins. A weighty wine for the lamb to follow. Lamb came perfectly cooked, showing off the animal's characteristically strong flavor, backed by a certain smokiness deftly tempered by zucchini. 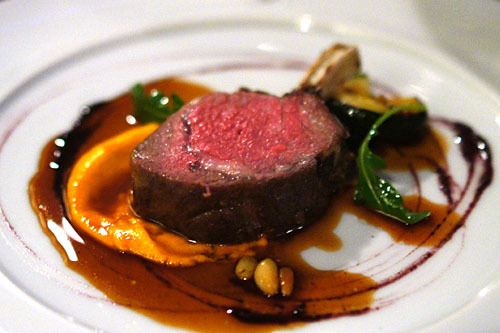 Interestingly, I thought for sure that I'd find the carrot purée overly saccharine, but instead, it was subtle, delicate, and a fitting accompaniment to the gravitas of the lamb. This was perhaps the most conventional of the dishes that we had. Chocolate and ice cream is a classic, but effective pair. 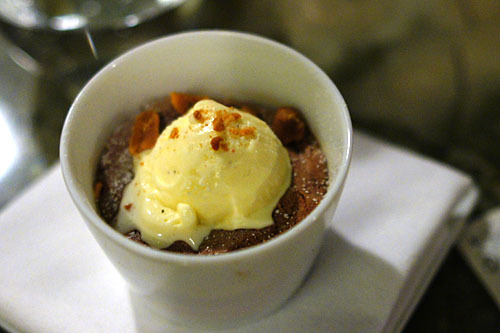 Here, the ice cream was tarted up with the addition of coconut and rum, while the peanuts imparted a nutty tinge to the dessert, as well as a great textural counterpoint. 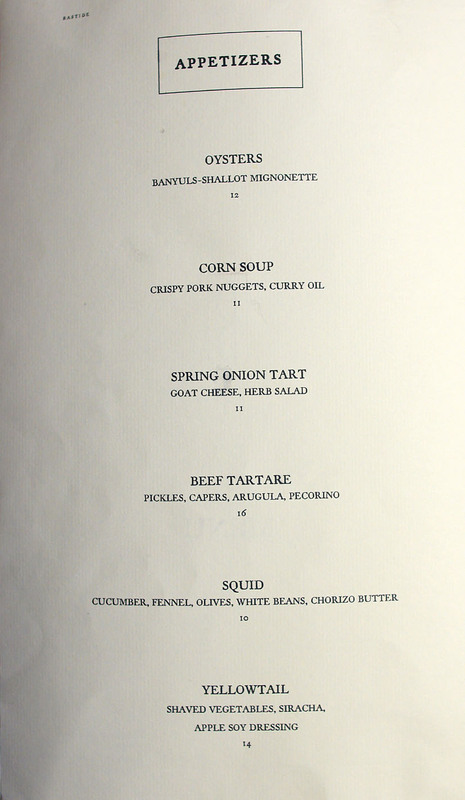 Our special degustation is shown on the left, and I've also included photos of the standard à la carte selections. Click for larger versions. How would you describe the interaction between the bloggers and magazine editors/employee? 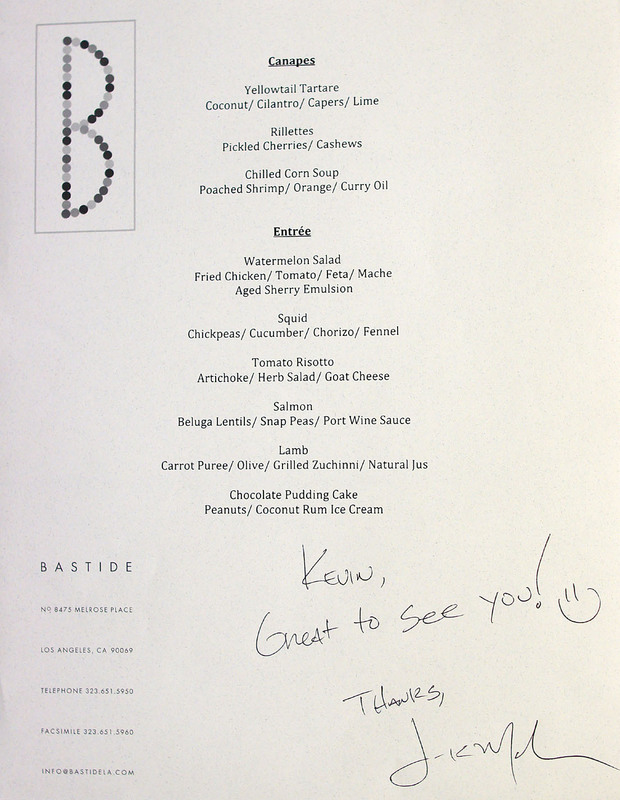 Kevin: For a split second, I almost thought you were going to blog about the opening of Bastide's $15 Mondays. 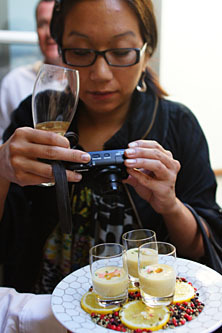 Stuffycheaks: Some small bites offered are: 1) Yellowtail tartare with coconut, 2) Basil and citrus and 3) Summer corn soup with crispy pork nuggets and curry oil (http://lasates.com/bastide-mondays-0). 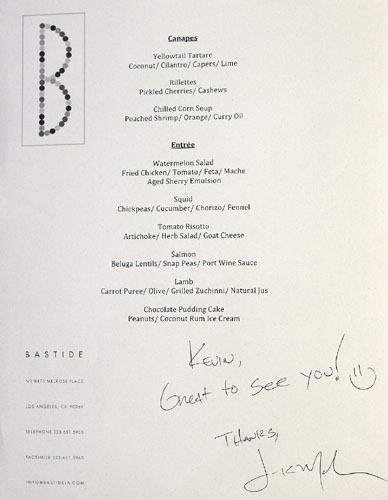 Kevin: Do you know what else, food-wise, is available for Bastide's $15 Mondays? Waleed: A bit uneasy, though that may just be because we, in many cases, didn't know each other (it was our first time meeting). 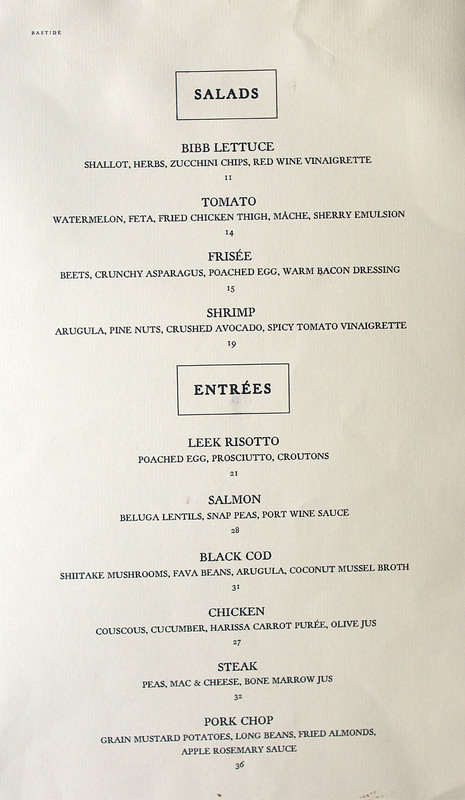 Stephanie: It's basically a changing selection of passed hors d'œuvres during 5:00-7:00. 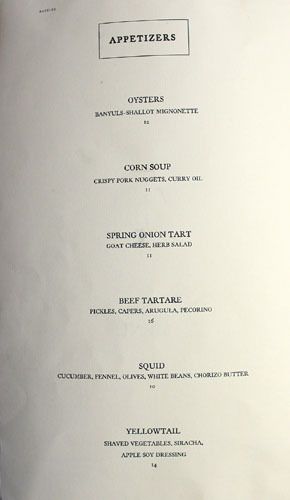 However, the regular menu is also available. And yes, I believe you can grab a seat anywhere. I look forward to your post! Ann: I thought I did? 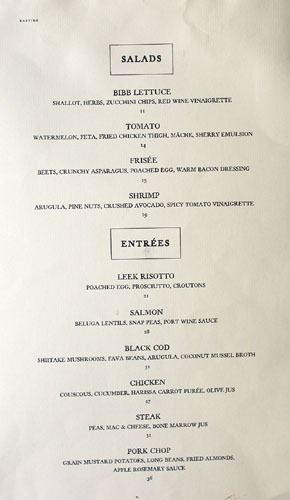 ;) As for the food, the standard menu is still available, in addition to the canapes.